I found this postcard at a Collectors' Fair and was taken by the subject. 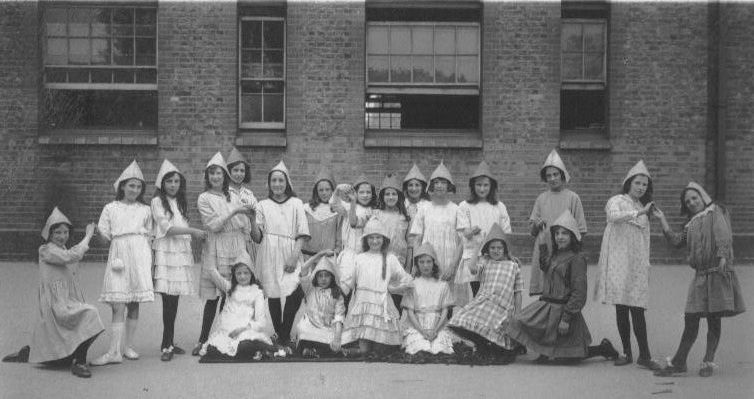 The girls are possibly from a dancing class, as they are wearing shoes with ribbons, have special rather pointy hats, quite elaborate frocks and are holding hands in pairs. Unfortunately the card has not been used so there is no postmark to date it. Perhaps 1940s? The photo is by 'Wakefield's, 1, High St., and 21, the Mall, Ealing, W.5. Tel. 200 Ealing'. Perhaps that gives someone a clue as to date? If anyone can provide any information about the location, date or possibly even identify the dancers, please email.